Revelation of the series for New Zealand. The compact technique, the cool head, the wide array of strokes heralded a new Test star on the horizon. Former New Zealand players who saw him bat reckoned he should go on to score at least 15 centuries. He scored two in the first two Tests, coming in at 40 for 3 and 23 for 3. The second was a double. Was perfect at gully and, at times, third slip. Was the spirit that kept New Zealand high. Ran in over after over against the most experienced batting line-up. Made a successful comeback from injury and overcame the selectors' reported reluctance to field him. Repaid captain Daniel Vettori's faith by ending as the second-highest wicket-taker in the series. Flashy, rode his luck, but had 322 runs at 64.4 and two centuries to show by the end of the series. If he tightens up his aggression at the start of his innings, he and Ryder can form the core of a solid middle-order for years to come. Was the most impressive slip fielder on view too. Very impressive behind the stumps, and did his bit with the bat too. Made sure New Zealand didn't lose the first Test by an innings. Kept India on the field for long enough with an aggressive century in Napier. His catch of Rahul Dravid in Wellington, moving down the leg even as he shaped to paddle, was spectacular. Didn't have the results to show for it - nine wickets at 50.22 - but has the makings of an ideal first-change bowler for New Zealand. Hits the seam hard, and could have done with more seam movement from the pitch. 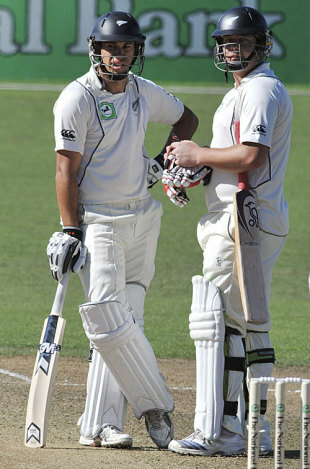 His batting improved a lot as he scored 61 runs and helped avert an innings defeat in Hamilton along with McCullum. Had totalled 61 in his previous 14 Tests. Big disappointment as a spinner, to the extent that he was more useful as a batsman. Scored a century in Hamilton, from 60 for 6, without taking undue risks. Will irk him that he couldn't do more in Napier when New Zealand were the only team who could win with two days to go. Led the side fairly well, though. Was the surprise package from New Zealand. Unlucky to have missed out in Wellington, where the pitch was expected to assist the fast bowlers more. Bowled really well in Napier, drifting the ball, getting it to turn too, and dismissing well-set batsmen - Sachin Tendulkar, Virender Sehwag and Gautam Gambhir twice. Came into the side as a specialist No. 6 batsman, riding on a successful domestic season with the bat. Didn't contribute much in the first Test, scored 52 in a total of 619 in the second, failed again in the first innings in Wellington, and scored 49 in the second after the series was lost. Was a much better bowler with swing in the air in Wellington, and generally deserved better series figures than 1 for 290. Showed his grit in the second innings in Hamilton, and also in trying desperately to get fit in time for the second Test. But scored only 12 runs in three other innings, and got out edging outside off too frequently for a No. 3 batsman. Showed flashes of brilliant strokeplay, but also showed his inexperience in the longer format of the game. Had already shown his preference for the front-foot play rather unsubtly, and Zaheer Khan kept troubling him with the short ball. But Guptill is not a stickler, and is one of the better top-order batsmen around in New Zealand. On evidence from this series, didn't look good enough for a Test top order. McIntosh got into trouble too often, didn't use his height as he didn't bend his knee, and barring one ordinary decision, contributed to his own demise with limp shots outside off. How got just one match and 11 balls, and didn't do much to help his average of 22. Collectively, the top three, though still inexperienced, gave New Zealand their biggest headache with starts of 40 for 3, 75 for 3, 23 for 3, 80 for 3, and 84 for 3. Neither of them showed signs of having recovered from the beating they got in the one-day series. Mills' problems with no-balls continued, Southee continued to struggle for swing. Between them they gave away 271 runs for three wickets in one match apiece as Martin struggled for support from the other end.